Silver & Gold both had positive weeks in price action and macroeconomic news. The spot price for silver is closing the week around $15.50 an ounce while gold spot price is closing around $1315 fiat US dollars per troy ounce. The palladium spot price again hit fresh all-time record price highs eclipsing the $1600 oz mark on a number days this week. Platinum remains floundering around the $850 range to close the week. Much of this week’s small precious metals related price rally could be attributed to the fact that the private Federal Reserve announced this past Wednesday that they will not be executing any more interest rate hikes for the remainder of the year. This announcement comes only 3 months after they said two rate hikes would be appropriate for 2019. Perhaps within all our lifetimes, we will never again see real interest rates above true price inflation. That being said, precious metals tend to perform well in negative real interest rate environments. New today, it appears President Trump is now moving to appoint conservative commentator Steven Moore to a vacant Federal Reserve governor position. Moving on this week’s first-time guest to the show. 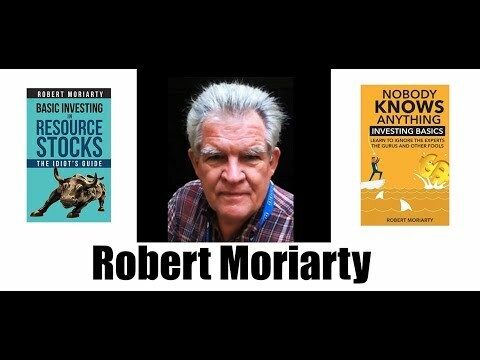 Bob Moriarty is the purveyor of 321gold.com and the author of the new book entitled, “Basic Investing in Resource Stocks: The Idiot’s Guide”.